MEDPOR® is comprised of a lightweight, porous form of high-density polyethylene, a material with a long history of medical applications. Its unique, highly porous texture allows vessels to incorporate into the enhancement shape, integrating MEDPOR® into a patient's tissues. The shape and size can be customized by your surgeon to fit your individual needs. MEDPOR® eliminates the need for grafts or silicone implants. Surgeons could select from sphere implant diameters of 14 mm to 22 mm. A resterilizable sizer set is available for selecting the appropriate implant diameter at the time of surgery. The Conical Orbital Implant (COI) ® was designed and developed to address several of the common problems associated with the correction of the anophthalmic socket. The COI® design provides removal of the anterior surface of the channels in the medial, lateral and inferior quadrants. features highly uniform interconnected pores of approximately 500mm in size. The extensive pore system enhances fibrovascular ingrowth which keeps the implant from migrating and allows the secure attachment of extraocular muscles, thereby improving implant motility. 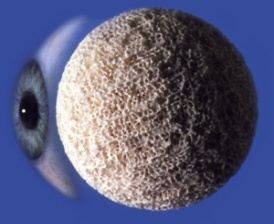 The Bio-eye hydroxyapatite (HA) ocular implant is a spherical (ball-shaped) implant composed of natural coralline HA. It is used to replace the volume of the orbit when the eye is surgically removed, or as a replacement implant in patients with a poorly functioning, pre-existing implant. Ocular Implants provide surgeons with porous biocompatible implants for orbital reconstruction following enucleation and evisceration procedures. The interconnecting, omni directional pore structure of the MEDPOR® Biomaterial allows for rapid vascularization and soft tissue in growth. Surgeons could select from sphere implant diameters of 14mm to 22mm. A resterilizable sizer set is available for selecting the appropriate implant diameter at the time of surgery. It could could be easily shaped with a scalpel. Its lightweight property, the biocompatibility of the porous polyethylene, and the ability to place the implant deep in the socket contribute to the overall popularity of this implant. Motility could be enhanced by suturing the extra ocular muscles directly to the implant or to an overlying fascia or scleral wrap. As with all orbital implants, it is important to have a tension free closure over the implant. Designed in Conjunction with Peter A.D. Rubin, M.D. The Conical Orbital Implant (COI)® was designed and developed to address several of the common problems associated with the correction of the anophthalmic socket. The COI ® design provides removal of the anterior surface of the channels in the medial, lateral and inferior quadrants. Unique design elements have been incorporated into the overall conical shape, including a superior projection and channels for the rectus muscles. The volume of the superior aspect of the implant is to help reduce the possibility of a post operative superior sulcus defect. This shape is intended for use after standard enucleation procedures. The implant is primarily intended to (1) fill the void volume resulting from an enucleated eye, (2) provide a method for reattaching the rectus muscles, and (3) provide a compatible surface for an overlying ocular prosthesis. is composed of subcutaneous fat and overlying dermis. Its advantages include the fact that it is an autologous graft and, thus, lacks concerns for bio-compatibility in disease transmission. However, there is a certain degree of fat atrophy which could occur leading to somewhat unpredictive and result of volume. Dermis fat graft could be used as a primary procedure following primary reconstruction for orbital exenteration, as a low cost means to provide an orbital implant and in instances in which enucleation is performed early in childhood since the fat could grow and provide stimulus for orbital growth. Dermis fat graft can also be used in several secondary procedures such as a replacement of an extruded orbital implant and correction of deep superior sulcus deformity. The surgeon could choose one of several donor sites including the lower abdominal quadrant and the outer quadrant of the buttock. 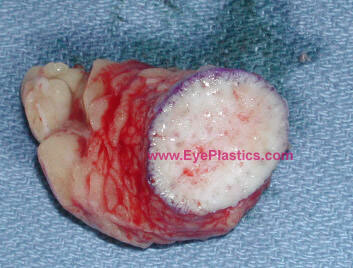 Typically a graft is measured approximately 25 mm in diameter. The epidermis could be abraded with the derma-brader or with a #15 blade. The graft is harvested with an attempt to minimize mechanical manipulation of the graft and to quickly insert the graft into the previously prepared recipient bed. Often the dermis has slight surgical modifications in order to create a dome shape to it which often provides better motility for the prosthetic implant. 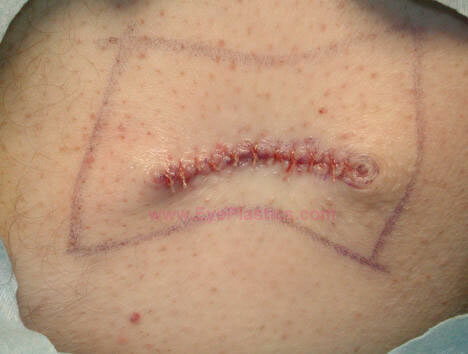 Complications from dermis fat graft include atrophy, central graft ulceration, granuloma formation, cyst formation, keratinization, hair growth, symblepharon, or/and donor site morbidity.